Legal Tender Notes: Types 1 to 4. Currency Commission. Lady Lavery. Type 1. 1928 Signatures: (1) Joseph Brennan. (2) J. J. McElligott. (a) Fractional prefix in serial number. Type 2. 1929-37 Signatures: (1) Joseph Brennan. (2) J. J. McElligott. Type 3. 1938-40 Signatures: (1) Joseph Brennan. (2) J. J. McElligott. Type 4. 1940-42 Signatures: (1) Joseph Brennan. (2) J. J. McElligott. (a) ETO code added to design as an extra security measure. Legal Tender Notes: Types 5 to 14. 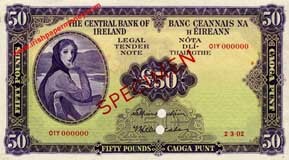 Central Bank of Ireland. Lady Lavery. Type 5. 1943-44 Signatures: (1) Joseph Brennan. (2) J. J. McElligott. Type 6. 1943-52 Signatures: (1) Joseph Brennan. (2) J. J. McElligott. Type 7. 1951-53 Signatures: (1) Joseph Brennan. (2) J. J. McElligott. (a) From this Type on, serial numbers are extended on 10/-, £1, and £5 notes only. Type 8. 1954-55 (a) Signature change to: (1) J. J. McElligott. (2) O. J. Redmond. Type 9. 1956-60 (a) Signature change to: (1) J. J. McElligott. (2) T. K. Whitaker. Type 10. 1960 Signatures: (1) J. J. McElligott. (2) T. K. Whitaker. (a) From this Type on, serial numbers were extended from 100000 Terminator to 1000000 Terminator on £10 notes. Type 11. 1961-68 (a) Signature change to: (1) M. Ó Muimhneacháin. (2) T. K. Whitaker. (b) Designation of value of note “...POUNDS STERLING PAYABLE TO THE BEARER ON DEMAND IN LONDON” dropped, and replaced by the denomination of the banknote in words. 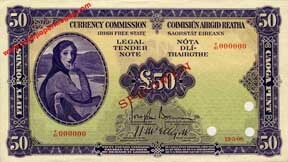 The currency of Ireland was Decimalised at this point. It became based on a Pound equal to 100 new pence. The banknote with Ten Shillings denomination (now equal to 50 pence) was discontinued and withdrawn. Type 12. 1969-75 (a) Signature change to: (1) T. K. Whitaker. (2) C. H. Murray. Type 13. 1971-75 Signatures: (1) T. K. Whitaker. (2) C. H. Murray. (a) Metal Security thread added to £1, £5, and £10 denominations only. Type 14. 1976-77 (a) Signature change to: (1) C. H. Murray. (2) M. O Murchú.